All LA officers seeking bicycle certification must take a training course through the police department. Yesterday two of the instructors of that course, members of the LAPD Bicycle Coordination Unit, came to LACBC headquarters downtown to meet with City of Lights people. In our outreach at the Carecen Day Laborer Center near MacArthur Park, we've heard from multiple people about getting ticketed for sidewalk riding. 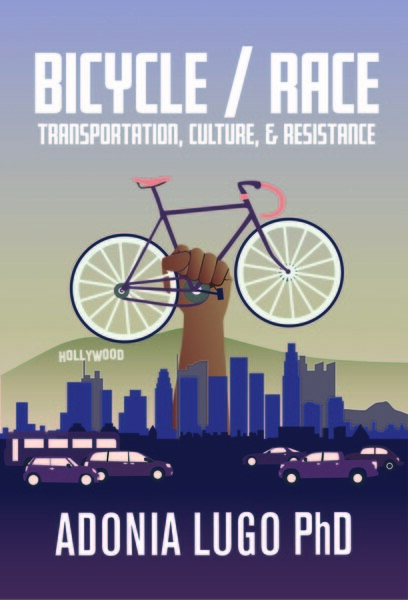 Technically it is legal to ride on the sidewalk in LA, though officers are allowed to cite bicyclists for riding on sidewalks with a "willful or wanton disregard for the safety of persons or property" (LAMC 56.15). This complicates matters when you're trying to educate bicyclists about their rights. Basically an officer can cite a person for sidewalk riding if he/she feels like it, especially if the cyclist does not speak English and is unprepared to defend himself. While most of the bike advocates I've spoken with strongly advise riding as a vehicle instead of on sidewalks, there are still many people in LA who feel safer on the sidewalk (even though in reality the sidewalk rider exposes him/herself to far more blind driveways). Okay, so moving from there, the issue we've come across is that riding on sidewalks around MacArthur Park and the Metro station there has led to some day laborers getting tickets. My collaborator Allison went to the park to investigate signage there, and discovered that there is no clear stance on whether it's okay to ride a bike in the park or by the station. We presented photos of these ambiguous signs to the very gracious bike school instructors, and they agreed that the situation is unclear. However, as they emphasized over and over, there's not much that can be done in terms of changing enforcement of the law; officers on the street won't listen to other officers telling them what to do. Police culture aside, it is true that what we need to do is lobby for less ambiguous policies around bicycling, but as someone who is currently fighting a jaywalking ticket, I know that vulnerable road users get scapegoated in LA as a cause of traffic. Selective enforcement does have an impact because it determines how policies get implemented; in this way cops do play a role in interpreting policy. It's going to take a lot more work to decriminalize carfree mobility in Los Angeles, but at least there are thousands of officers out there who have bike school certification, according to the folks we met with. But what are they learning in bike school? One of the issues we discussed was riding in crosswalks, which has been covered recently by LA Streetsblog and SoapBoxLA. According to one bike instructor, it is always illegal to ride a bike in a crosswalk because bikes are considered vehicles, and the bicyclist would be going the wrong way, traveling perpendicular to the flow of traffic. Bikes should be walked across crosswalks because off a bike a cyclist is a pedestrian, the instructors agreed. As an example, they mentioned an LAPD officer who was riding across a street in a crosswalk, was struck by a car, and then was cited for riding in a crosswalk. Later in the day we talked with a longstanding bike advocate about the crosswalk issue, and he pointed out that it's a bunch of BS because bicycles are not "vehicles"; they are "devices" in California law. Bicyclists are not pedestrians, and we're not drivers, yet we must fit into a legal system built around those statuses. This leads to much illogic.